A leading manufacturer of custom expanded polystyrene (EPS) cushions. Whether it is protective packaging for consumer electronic products, production, trays, spacers, insulated containers for the biomedical industry or per shables, we can take care of your needs. A leading manufacturer of custom expanded polystyrene (EPS) cushions. Whether it is protective packaging for consumer electronic products, production, trays, spacers, insulated containers for the biomedical industry or perishables, we can take care of your needs. Please click on these links to see our products and services, if the product that you are looking for is not on this page, please do not hesitate to contact us. EPS and the hybrid resins that we process have many uses and applications, and KB Foam has the network and experience to support you. We will be happy to hear about your projects, and would relish the opportunity to help you with your individual needs. 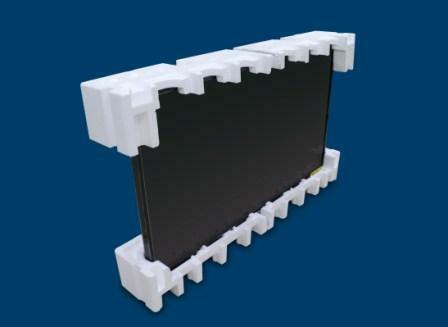 KB Foam has extensive experience manufacturing protective cushions for consumer electronic products like flat panel TVs, personal computers, and monitors. Our parent company Kasahara Industry Co. has many years of experience serving the Japanese automotive industry. Expanded polystyrene containers are well known to be the best choice to transport temperature sensitive products and perishables around the world. KB Foam can support the manufacturing of aluminum molds for the production of expanded foam cushions. KB Foam has been a leading manufacturer for over 20 years in the San Diego-Tijuana region, and has had the opportunity to be a reliable supplier for world class companies like Sharp, Sanyo, Panasonic, Foxconn, Qisda, Ernest Packaging, Sony, Pioneer Speakers, Hitachi, JVC, Canon, Mitsubishi, NEC, Harman Audio, Casio, and Gerard Roofing.